Life has been full lately — full of good things like travel and delicious food and tantalizing ideas, and also full of difficult ones. I’ve struggled against an onslaught of difficult news cycles. School shootings, dead children, murders, missing people. As a journalist and an editor, my job is to help shape how we cover these things. I am a staunch advocate for giving voice to the voiceless. It’s necessary and important so that we don’t get sucked into the horribleness of news and forget that the people in these crimes are, indeed, people. But that work — even from the sidelines — takes a toll. This is the career that I chose but, in some ways, it also chose me. Either way, I love it. I believe it’s important work. It’s also work that led me to create Sarah’s Cucina Bella more than 12 years ago. I needed a life-affirming creative outlet to offset the intensity of my career in journalism. In food writing I found something even better than I expected. Food is life and love. It brings people together in a powerful way — over dinner tables, across generations and through screens. Food is nourishing to the soul and the body. Likewise, food writing is nourishing to the mind. I love all of it — from the sharing of food to sharing of recipes. And whether it’s a complex recipe like Herb Chicken Breasts with Brussels Sprouts Hash and Mashed Potatoes enjoyed with company or something as simple as a plate of cool, juicy cucumber slices and crisp, crunchy carrot sticks eaten around the coffee table on a Sunday afternoon or a breakfast sandwich to enjoy alone, food is everything. 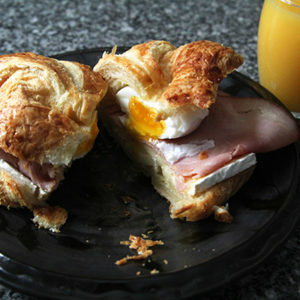 This Ham, Egg and Brie Croissant Breakfast Sandwich recipe has layers of flavors and textures that come together to create a satisfying sandwich, perfect for breakfast or lunch. Life is like that too — never one note. Good and bad and difficult coexist to create our life experience. But let’s talk about the sandwich. On a warm, flaky, buttery croissant, creamy brie cheese grows soft. 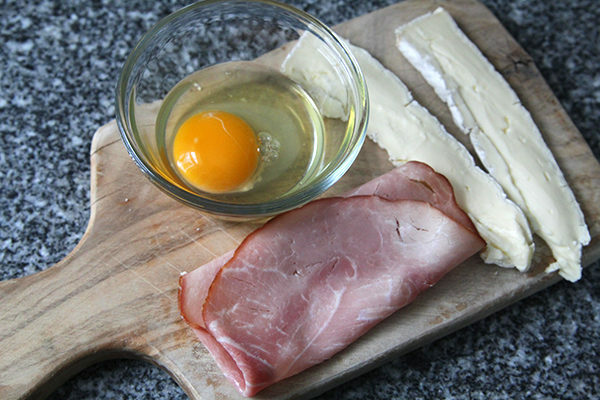 Slices of rich, slightly sweet ham are topped with a tender, velvety poached egg. This is a recipe built for one, but you could easily double or triple it to feed more people. It’s easy to make — heat the croissant, poach the egg, layer the ingredients — but the instruction comes in the how to do these things. When you slice the croissant open first, it makes creating the sandwich easier since you aren’t struggling against a soft and crispy hot croissant. Slicing the brie thinly allows the brie to evenly warm, leaving it so creamy. Poaching the egg means a perfect runny yolk and a delicate egg white. The glory of this sandwich lies as much in the process to create it as it does in the finished dish. That’s probably a good metaphor for life too. 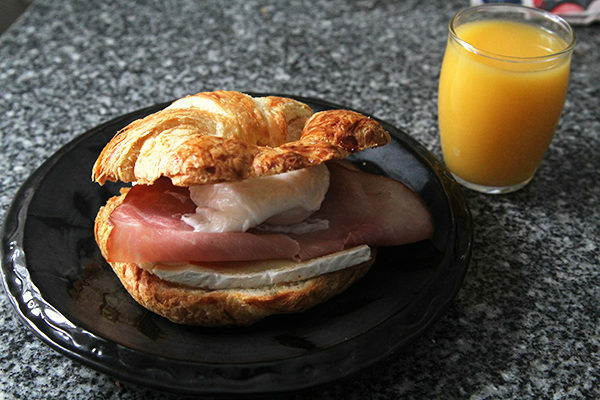 Flaky, buttery croissants are perfect for this easy, delightful breakfast sandwich with creamy brie cheese, rich poached egg and savory ham. Preheat oven to 325 degrees Fahrenheit. Slice the croissant open as you would a roll. Place the halves back together on a baking sheet and slide into the oven. Bake for 8-10 minutes, until hot. Meanwhile, to poach the egg, set a pot of water on a burner and heat to boiling. Reduce heat. Crack the egg into a small bowl and then slice the egg into the water. Cook for 4 minutes. Remove with a slotted spoon. Upon removing the croissant from the oven, place on a plate and open. Top one half with the brie cheese, ham and poached egg. Cover with the other half of the croissant. I just finished a very similar sandwich. But it was missing the brie, which, in retrospect, was a huge mistake.